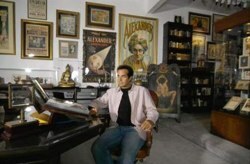 Could David Copperfield’s world famous warehouse/museum relocate? A local Las Vegas developer wants to build a massive $ 1.95 billion, three stadium sports complex directly off the Strip. The only problem? Current plans don’t account for parking, which considering they are buildings for a capacity of 39,000 at the largest facility would require just as much space as the stadiums would. The Las Vegas Review-Journal reports the land the developers are eyeing for parking includes the legendary building owned by Copperfield which contains the largest privately held collection of magic history in the world. So far, there has been no official contact between the developer and Copperfield. A spokeswoman for Copperfield said the magician had not been contacted to sell his 3.8 acres at the corner of Russell Road and Valley View Boulevard, which includes a warehouse. Obviously, none of this matters until Team Copperfield is contacted but it is certainly and interesting possibility.